The construction and industrial product lines of IH, Hough, Dresser and their successors are presented along with brief histories of these three companies. Also included are IH engines that powered these machines, many of the IH-powered machines built by other companies, and military production. 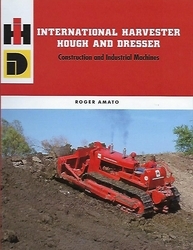 Appendices present Nebraska crawler tractor test results, condensed specifications and production ranges for the construction products, and an overview of scale models of the machines discussed in the book. 97 B&W and 194 color photos, 136 illustrations from sales literature, 53 images of models.